So, what to do? I have a virtual server at my disposal anyways, so i tought I would just go install an OCS server (OCS is name of the protocol being used by GHNS) there and be done. But, turns out — there isn’t any (reasonable, maintained) free implementation of the server side of this protocol. Sigh. Alright, this can’t be so difficult, can it? So, I went ahead and created a very minimal implementation of the protocol in django + python, which only supports a small subset of the protocol. It implements exactly those methods which are needed to function with the KDE GHNS upload and download widgets (some fields are still missing, I’ll add them in the following days, also data validation and user registration are incomplete, but other than that it works). And let me tell you… this OCS specification! Every response contains a “status” field (which contains “ok” or “failed”) and a “statuscode” field. The status code is always 100 if the requests succeeds, and if it’s not 100 something went wrong. So, where’s the point of the status field? The specification mainly works through providing examples. That’s not a bad thing by itself, but it would be good if at least the field names and their possible values were always fully listed and explained outside of an example. This is not the case (example; example2 — here, what is e.g. “latitude”? How am I supposed to format the data in that field? I mean you can guess from the values in the example for a similar call, but still… Also note how a person only has 6 homepages while a content has 10… and 12 downloads… and 3 previews). Generally, there’s lots of stuff which is just unspecified and you can only guess it from the examples. Bad. In uploadfile, there’s various error conditions, but none matches e.g. “the item to which the file should be added was not found”. In return, there’s “localfile not found” which means… um… whatever… maybe the server couldn’t find the file on the client’s computer? It has typos. E.g. in edit, it has a field named “downloadtyp1”. This looks just weird, shouldn’t it be “downloadtype1″? What do I do now, implement the weird one and rely on everyone else following the spec closely too? Or guess that this is a typo and that everyone else probably corrected it? I’ll go for the former. It has nonsensical field values, e.g. this: donation – do you want donation for this entry? possible values are “yes” or “” for no donation. Sure, why allow “no” if you can just leave the field empty… I mean, specifying to treat empty as “no” is ok but this is just weird. In download, there’s this confusing thing: contentid – Id of a content; itemid – Id of a content — Hm. You can guess that the itemid probably means like “the 3rd download item in this content entry”, but what is it? Can I use my own IDs here? Probably not. Do they start at 0, or 1? Probably 1, but I don’t know. It leaves quite a few other questions open, for example, can there be more than one entry with a given title? I could continue this list for a while, and I only tried to implement about a tenth of the spec. Stay tuned, I’ll surely post about GHNS integration into kdev-python soon-ish. To be honest, it's a shame that KDE keeps on relying on some extremely closed platform that is "open" desktop (where's the open?). I hope that sooner or later (more later than sooner) a Free alternative is made. I'd recommend to get together with Aaron. It might be the time to add support for a different protocol in GHNS and supports the free (and hosted on git.kde.org) bodega server. This is now the third time that I hear these problems about OCS and not only from KDE developers I have heard that. As Frank wrote, actually there were a few implementations already 1-2 years ago when I checked. Too bad, no one stood up earlier, but even KDE got at least one for Gluon last year. thanks a lot for you blog post. First I want to say thank you for writing a new OCS server. OCS was always as a distributed service but somehow one cared about writing and running new instances. So thanks a lot for that. I agree with most of your critic about OCS 1.x It's written some time ago and a few people are working on version 2.x at the moment which should fix most of the things you mentioned. So I suggest to get in contact with the other OCS people on the mailinglist if you want to contribute. thanks for your reply. I'm glad to hear that OCS 2.x is being worked on, and that it aims to resolve the issues which 1.x has — that's a good thing in any case. You can find the discussions on the mailing list. If I recall correctly, there was also a draft up on freedesktop.org for v2. 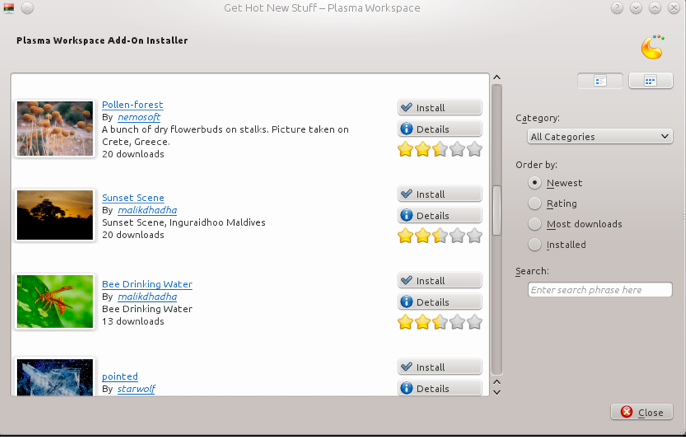 In instance is already available on the KDE infrastructure. It does not support random uploads (it tracks git repos instead), but that could be added. Still things to do in Bodega, but it works and has a free software implementation. bodega seems like a good thing for the future, but given that it's designed for a quite different use case than mine (I need a desktop client) and that it's quite young, and written in a technology I have no idea about (this server-side JS thingy) I concluded that it would probably be more effort to get this running well than I was willing to spend on it right now. I'm sorry for this. synchrotron looked like exactly what I was looking for, but somehow it doesn't support the methods the KDE GHNS widget needs? I tried it, and the widget seemed to call e.g. /content/categories and then failed, since the server didn't support that call. Also the server required some parameters for the other calls (e.g. provider=) which are not specified in the OCS protocol and which the KDE widget doesn't supply as far as I could see. In addition, it didn't support any kind of uploads. This again led me to the assumption that it would probably be more work to get this working for my specific use case than starting from scratch. This kind of XML drives me nuts. One of the advantages of using XML is that you don't need to write your own parser, and it's easy to validate the document by providing a schema or DTD to the off-the-shelf parser you are using. The "XML" example you quoted prevents that. It was written by someone who thinks XML is just words with angle brackets around them. And you need to do a lot of manual work and custom code to parse it, which is exactly what XML was supposed to avoid in the first place! 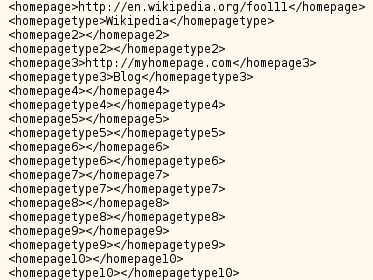 I had to deal with a server using "XML" like this in the past, and it just caused unnecessary work and frustration. The student was also doing a great job with implementing that JSON protocol in attica. It could be even better with the OCS2 improvements.